Rose Meissner receives E.M. Morris Award from Dean Rick Kolbe. 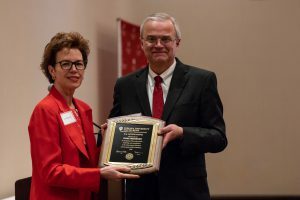 The Judd Leighton School of Business and Economics at Indiana University South Bend presented Rose Meissner, president of the Community Foundation of St. Joseph County, with the E.M. Morris Award at its annual Honors Day Luncheon. The E. M. Morris Award is given to an individual for distinguished achievement, leadership, and contributions to the advancement of business and quality of life in Michiana. The award was presented to Meissner by Richard Kolbe, dean of the Leighton School at IU South Bend. Meissner said Judd Leighton was one of her earliest and most important mentors which made the honor even more meaningful. Under her leadership, the Foundation has grown to be one of the top 100 community foundations in the United States, with combined assets of $185 million. Meissner holds a Master’s of Business Administration degree from the Kelley School of Business at Indiana University, and a Master’s degree in English Literature and a Bachelor’s degree in Economics from the University of Notre Dame. The Community Foundation of St. Joseph County is a charitable endowment dedicated to improving the quality of life for residents. Since it began in 192 the Foundation has returned more than $115 million in grants to the community. The E.M. Morris Award has been presented annually since 1976. Morris was the founder of the Associates Investment Company and a legendary business and civic leader in South Bend.